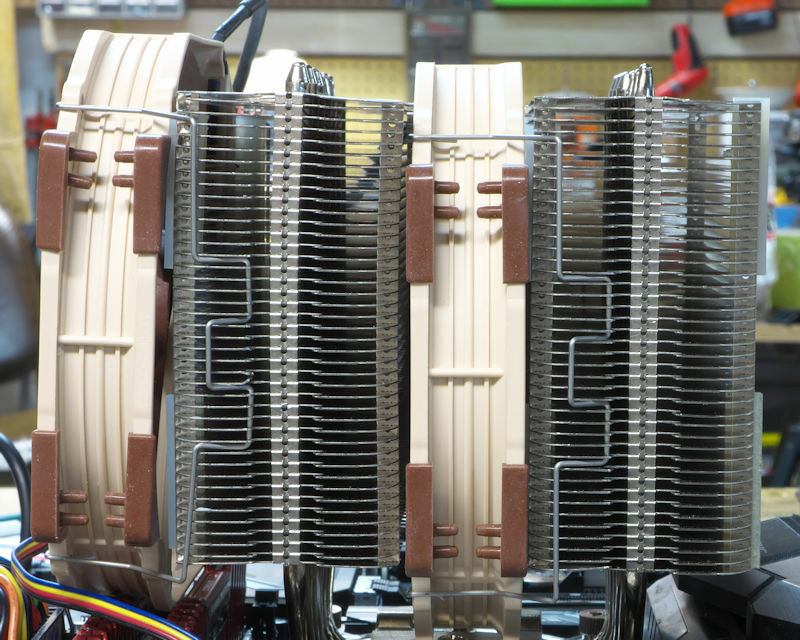 On a hot day in July, we decided to take another look at the venerable Noctua NH-D14 cooler. 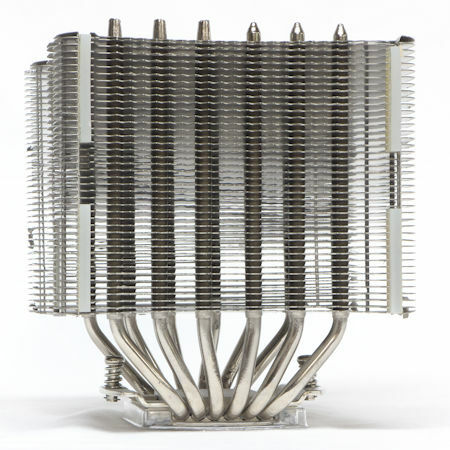 People may be wondering why are we looking at this heatsink again; it’s End of Life (EOL). But a lot of enthusiasts purchased this since it was new back in 2009 and likely still have it and would like to use it on modern platforms. In fact, the device can still be purchased new today — Noctua says this is because people still buy it. 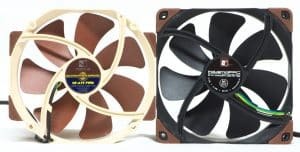 The focus on the mini-review here is to see how the old school CPU heatsink compares with a couple of new Noctua fans and see how that affects its performance. Read on to see what improvements were found. This will be a relatively short review because we are not introducing a new product. The NH-D14 was long ago superseded by the NH-D15 and the NH-D15S. 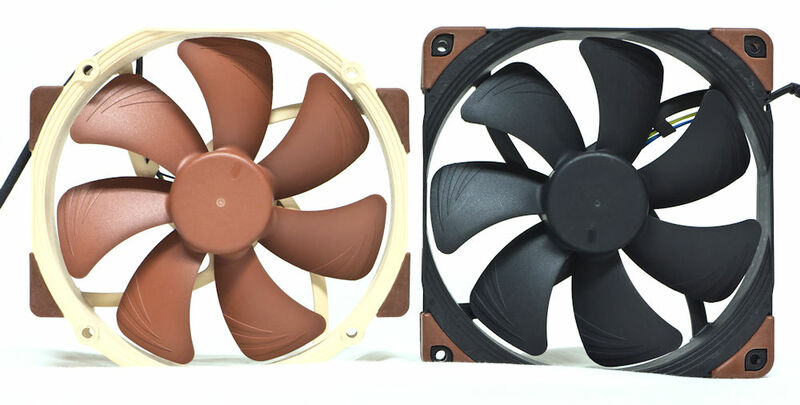 Noctua, of course, hardly needs an introduction; it is a leading seller of premium heatsinks, fans, and accessories. The original NH-D14 was outstanding in its day but came with voltage-controlled fans. When circuitry was available to defeat the clicking noise that PWM fans made, Noctua produced the NH-D14 SE2011 with NF-P12 PWM and NF-P14 PWM fans. Note that these are 12 cm and 14 cm fans, and they have designs that are old, now. What one can do with this old heatsink and new fans? Especially two 14 cm fans? Actually, what got this review started is the performance of two 2000 RPM A14’s on a D15. That combination came in dead last in a comparison of high-end heatsinks (see below in the Results chart). But how would the A14 do on the D14? Same (bad)? Or different (hopefully better)? So, different fans were tested on a D14. 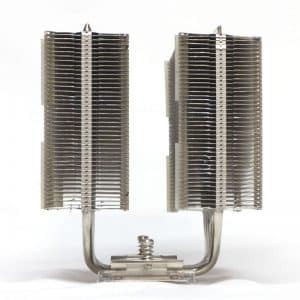 Noctua still maintains a product page for this heatsink. What is relevant for us is that this is a six heat pipe, “dual radiator” design – we would call it a tandem tower today. It uses the SecuFirm2™ mounting system with their TIM, NT-H1. It won a number of awards way back when it was new, and it deserved them. The heatsink was acquired retail. 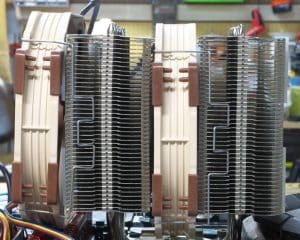 The various fans were supplied by Noctua. According to specs, the original P12 that went in front spun at 1300 RPM, generating an airflow of a little more than 54 CFM at 19.8 dB. The original P14 middle fan had a speed of 1200 RPM, with an airflow of 65 CFM at 19.6 dB. The current A15 spins at 1200 RPM, making 68 CFM at 19.2 dB. The 1500 RPM A14 blows 82.6 CFM at 24.6 dB. Thus the modern fans simply put out more air. Noctua did not publish static pressure numbers for its old fans, but looking at current specs the modern fans make more of that, too. Finally, look at the results chart to see how much noise the fans made when they were hooked up to the D14. 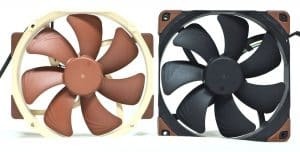 Noctua made two fans with identical impellers, including the blades. Here we show them side by side. Identical blades show up with their “Flow Acceleration Channels.” “Stepped Inlets” cover different parts of the frame in the two fans. There are Inner Surface Microstructures on both frames though they are hardly visible in front shots. The obvious difference is dimensional. The A15 is 150 x 140 mm, while the A14 retains the classic 140 x 140 mm frame. The NF-A15 is a 140 mm fan with screw-holes that are 105 mm apart, as on 120 mm fans. So it is compatible with the clips that came with the NH-D14. The NF-A14 comes both as premium and industrial Protected Performance Cooling (iPPC) versions. The latter fan was “ruggedized” and has a fan motor with three phases instead of the standard two. The A14 needs special clips, though, because it has standard 140 mm fan screw-holes. The A14 adapter is made for the D15 but it stretches to fit a D14. In the second picture (click on it if to enlarge) shows the side vents which give an A15 its elongated structure – a half-cm expansion on each side. The A14, of course, has only corner vents; but the A15 has those as well. The NF-A15 PWM is available at 1200 RPM only, while the NF-A14 PWM is available at 1500 RPM (premium packaging) and 2000 RPM (industrial style). The A15 is supposed to snuggle down into the heatsink. Since the early i7 and i5 days, Intel has allowed motherboard makers to put heatsinks along the top edge of their boards. 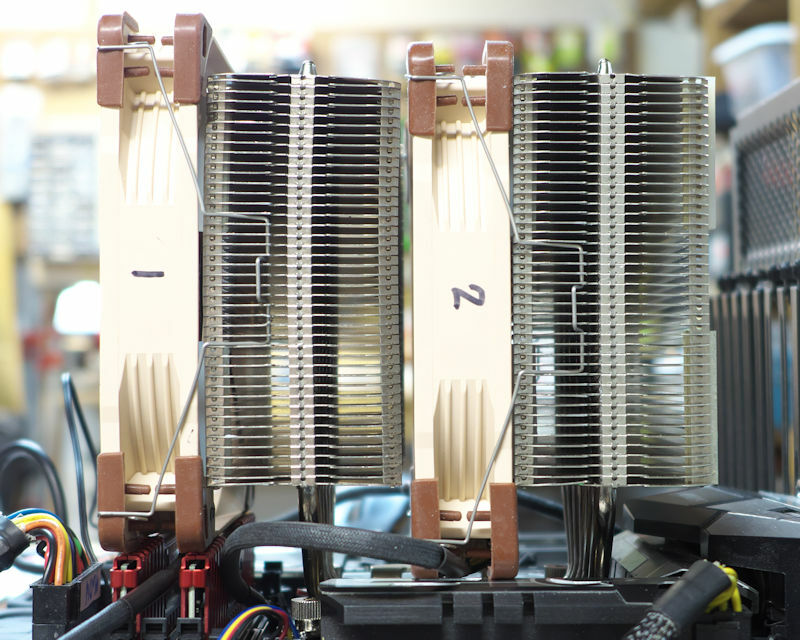 These heatsinks directly interfered with square 140mm fans, so the fans were tilted. Thus one would expect that the A15, because of its shape, would sit lower than the A14. Well, one would be wrong. Below we have two NF-A14’s in the left image and two NF-A15’s in the right image. Contrary to our expectations the middle A15 does not sit appreciably lower than the A14. Of course, the front fans are pushed up by the RAM – and this is low profile RAM. Users need very low profile RAM to make a difference in 140 mm fan height, and DDR4 highspeed very low profile RAM is not available as of this writing, so you will need a case wide enough to accept this fan. An editor, remarking on his personal testing, noted that when one mounts the fans in “pull” positions on the D15, he saw identical temps while solving RAM compatibility issues. This is an intriguing finding because if a user has the D14 and tall RAM, placing the fans in a “pull” position is a quick, easy, and cheap fix to the problem of RAM compatibility. The left picture shows a side view of a bare NH-D14. We are able to see the nylon bumpers that the front fan goes against (grey strips running vertically on the left and right sides). In the right picture is a D15. The pictures are not quite to scale, but the D14’s fin stacks are no thicker than those of the D15. With the current review, we are returning to our 5 GHz setup. The Vcore was set manually to a static mode (not adaptive mode) for testing consistency. The heatsink was given a day to give the TIM time to spread and thin out. Linpack operates in bursts. When the temps are rendered graphically, the traces look like a series of plateaus separated by valleys. Since we are interested in how well a heatsink cools, we measure the temperature plateaus. The Intel Power Gadget can keep track of the temperature of the cores in °C, logging this once a second. Each heatsink ran three times, 30 minutes per run. The runs were averaged. As apparent in the screenshot, the program occasionally spikes. These spikes generally go into the 90’s. The sound pressure level was recorded a meter away at a position “above” each heatsink (at a right angle to the vertical motherboard) in decibels with an A-weighting (dBA). While SPL in dBA is at best an approximate measure of what we hear, it is all we have. The SPL ratings are SPL minus 31 dB, which sounds like a silent basement. The temperature of the air entering the heatsink was logged every five seconds; the runs were averaged. The temperatures seen in the Results section represent average core temps minus average ambient temps, so to see what a user’s max temps would be, add the ambient temp to the net results presented in the chart below. As is apparent, the D15 with two 2000-RPM A14’s did the worst of all the heatsinks here. Hold on, though. When we test the same fans on a D14, that combination did the best. Worst vs best. And the two combos with 2 x NF-A14 2000 both made 15 dB noise over ambient. Not jet engine loud, but definitely there, and identical on two heatsinks. The NH-D14 and the fans it came with together make the second-worst showing. The other combinations are intermediate, but it looks as though the NH-D14 makes the best combination of noise and cooling when it is supplied with the premium NF-A14 at 1500 RPM. Click on the chart to get a full-size view. 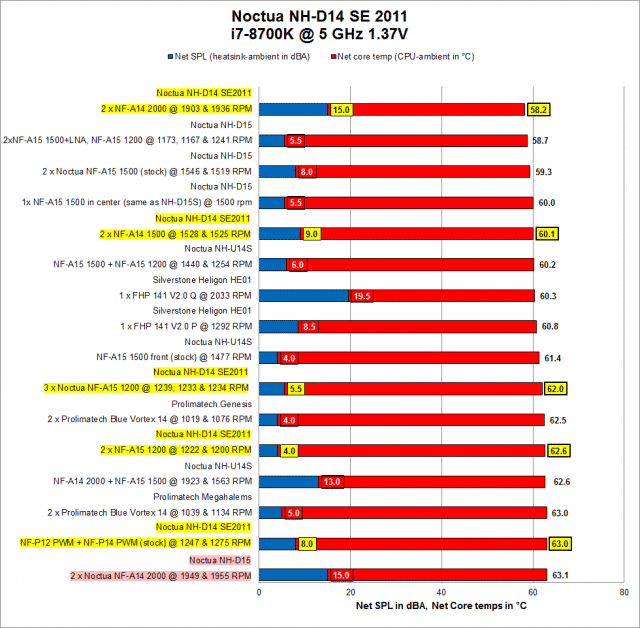 The Noctua NH-D14 has been a fine cooler over the years. It is EOL, but commenters frequently pipe up about their D14’s and they tend to like this heatsink. Are we able to bring it up to ‘modern standards’ just by replacing a couple of fans? These results say yes, we can. 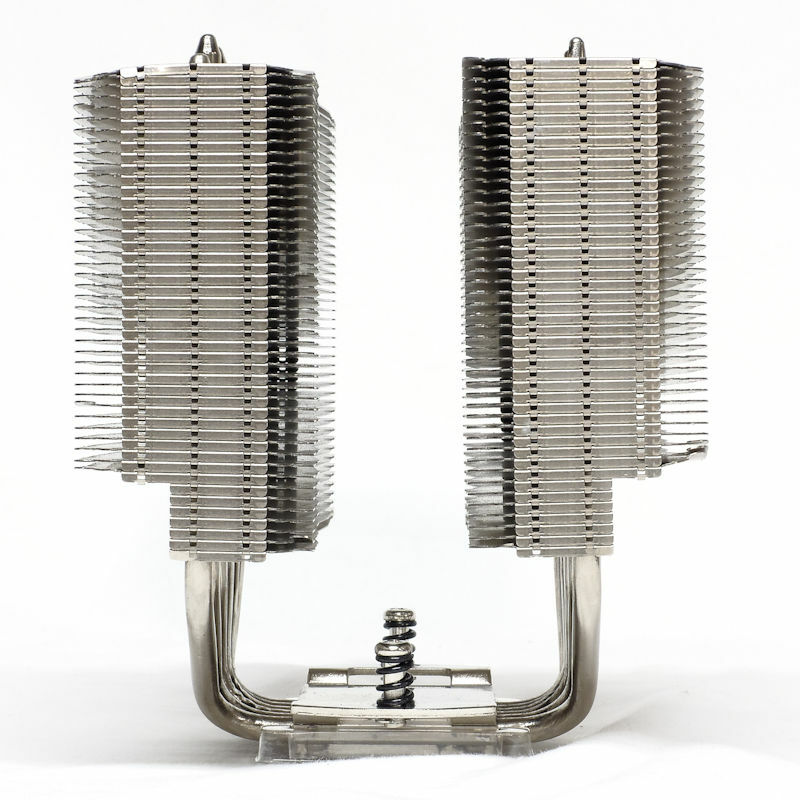 While the heatsinks are comparable, the modern fans move more air with less noise than the original fans and there is the difference. Users do not even have to dismount the heatsink to put new fans on it and the results say we don’t have to put on noisy fans to get better cooling either. Probably the best balance of cooling and noise comes when one puts a pair of NF-A14 PWM premium fans on the NH-D14. At nine dB, it is only one dB away from the stock combination, which generates eight dB of SPL. Another conclusion we can draw is that the D14 responds to increased airflow. The problem is that increasing airflow means increasing noise. Since Noctua is all about quietness, it is hardly surprising to find the 2000-RPM version of the A14 listed as an industrial fan. One could argue that there is only a 5 °C difference between the top finisher and the bottom. But we are enthusiasts here. 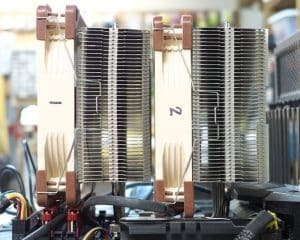 So if you have an NH-D14 and are thinking of updating you can consider a pair of modern fans, preferably the NF-A14’s.